I picked up a few things from my mother’s estate at the probate administrator’s office today. One of them was my baptismal certificate from Bethlehem Lutheran Church in Encinitas, CA. (where I now serve) when I was not yet 5 years old. We lived across the street from the church. The certificate is signed by Bethlehem’s founding pastor, with whom I am still in contact. 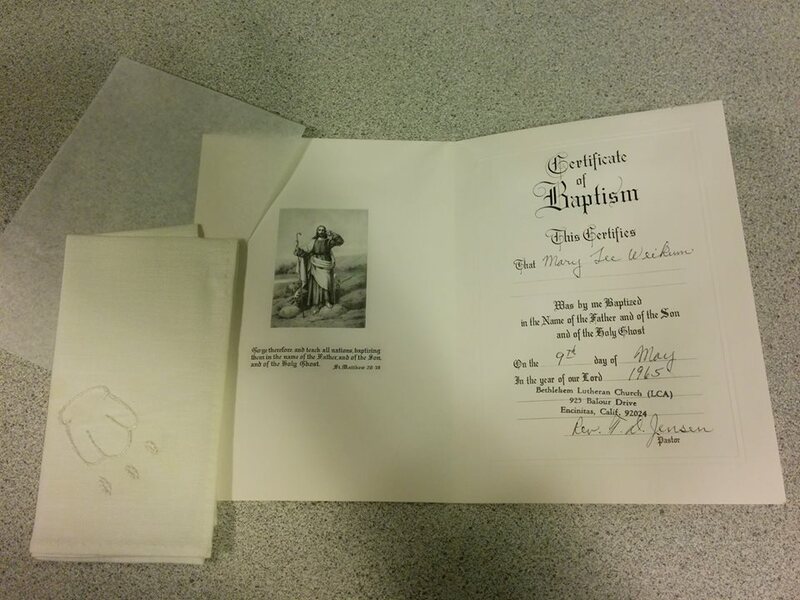 Tucked into the envelope was my baptismal napkin, embroidered by hand with a shell and three drops of water. This is what started me on this amazing journey. It occurred to me that what I should do with the napkin is not preserve it in the envelope (it is in pristine condition) but instead see if I can work it into some kind of cincture or towel symbolizing the diaconate that I could wear with my alb. We in the ELCA understand diaconal ministry as flowing directly – and abundantly – from our baptism. My mother and I had a difficult relationship, and much of her life was filled with dysfunction and stress. But still she brought me to the font, to the wellspring of God’s lavish and amazing grace. There do not exist sufficient words of thanks that I could tell her if she were here – and so I will take heart that in those later years, she found welcome again at Bethlehem, at font and table. That dysfunction and stress were washed away in God’s grace and forgiveness, she was fed at God’s table, and she found friendship in the family of God. And I am certain she has made lemon meringue pie (her specialty) for the heavenly banquet. Like the loaves and fishes, surely there will be enough pie for everyone. This entry was posted in Uncategorized by gardenmary. Bookmark the permalink. Thank you for sharing the beautiful story of your baptism and of your mother, Mary.